NASA’s Cassini spacecraft chronicled the change of seasons as it captured clouds concentrated near the equator of Saturn’s largest moon, Titan, on Oct. 18, 2010. When photos showed a large patch near the equator of Titan mysteriously darken and then grow lighter within a couple of weeks, scientists knew something big was happening on Saturn's largest moon. But what they found was something they didn't expect: a methane rainstorm in a region of Titan thought to be covered by vast, arid dunes. The photos taken by NASA's Cassini spacecraft on Sept. 27, 2010, showed a decrease in brightness over an area measuring over 1,200 miles (2,000 kilometers) long and 62 miles (100 km) wide. The area's system of dunes and parched riverbed-like channels were generally thought to be remnants of a wetter Titan climate hundreds of thousands of years in the past, said Elizabeth Turtle, a research scientist at Johns Hopkins University Applied Physics Laboratory in Laurel, Md., and lead author of the new study. "The poles are the only places that we have seen liquid in the form of lakes and seas, and we've seen cloud activity at the south pole, but what was really exciting was to see this activity at the equatorial latitudes that are predominantly arid," Turtle told SPACE.com. The research is detailed in tomorrow's issue (March 18) of the journal Science. Turtle and her colleagues examined other explanations for the darkening seen in Cassini's images, including strong windstorms and volcanism. Through their analyses, however, the researchers found that the effects of possible windstorms and volcanism on Titan were not consistent with the changes observed over such a large area. "The changes occurred within two weeks, and the wind speed that would be needed to transport material that far in that amount of time just isn't expected to be common at Titan," Turtle said. "It was alsovery hard to explain with volcanic processes. The simplest explanation is that it just rained on the surface and might have been enough to flood or pond in some areas." 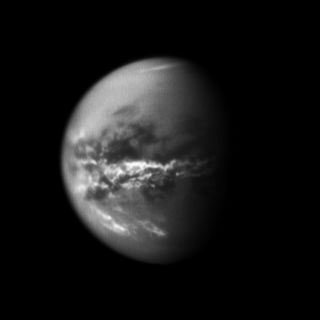 This large methane storm occurred around the time of the equinox, Turtle said, which suggests Titan experiences seasonal changes in its weather patterns, with clouds at high latitudes near the south pole moving across the equator and eventually up into the northern hemisphere as the seasons change. These observations confirmed some of the existing atmospheric models of Titan, but the findings also help the researchers better understand the climate of the satellite's equatorial region. "It was expected that there might be seasonal changes in the weather pattern, but we didn't know for sure whether the rain had occurred in the past to carve the channels or if it's actually occurring right now," Turtle said. "What these observations indicate is that it's occurring seasonally, and now is the season when it rains at the equator." Cloudy with rain. Simplified global atmospheric circulation and precipitation pattern on Titan and Earth. Most precipitation occurs at the intertropical convergence zone, or ITCZ, where air ascends as a result of convergence of surface winds from the northern and southern directions. Titan’s ITCZ was previously near the south pole (A) but is currently on its way to the north pole (B). The seasonal migration of the ITCZ on Earth is much smaller (C and D). This image appears in a Perspective by Tetsuya Tokano titled, "Precipitation Climatology on Titan." The results paint a clearer picture of Titan's overall climate. "Another speculation was that equatorial rainfall occurs very episodically in unpredictable intervals," said Tetsuya Tokano, a planetary scientist at the University of Cologne in Germany, who wrote a Perspectives article that appears in the journal alongside the study. "However, the new findings seem to indicate that tropical rainfall occurs more regularly with the seasonal cycle, although the interval between two subsequent wet seasons is long — about 15 years — due to Saturn’s long orbital period around the sun." This long orbital period makes studying precipitation and seasonal changes on Titan particularly difficult. The length of one year on Titan and the rest of the Saturn system is roughly equivalent to 29 Earth years, so Cassini's observations of Titan from 2004 to 2010 span only about one-fourth of that time. Furthermore, the Cassini probe, which orbits around Saturn, does not monitor Titan full time but relays snapshots of the moon periodically. "When Cassini got there, it was late southern summer, so roughly the equivalent to late January on Earth," Turtle said. "The northern spring equinox was August 2009, so now we're kind of the equivalent of early to mid-April." This means that Titan is experiencing something similar to the proverbial April showers. But if the atmospheric models hold true, the precipitation should eventually move up into Titan's northern hemisphere as the seasons change. "Equatorial precipitation is likely to occur near equinoxes," Tokano told SPACE.com. "The rain belt, while being intermittent, swings between the south and north pole, so every area on Titan could experience rainfall in the course of a Titan year." Turtle and her colleagues will continue to watch the changes in Titan's climate in the coming months, particularly looking to see if the precipitation travels into Titan's northern hemisphere, as predicted by atmospheric models. "We'll be very anxious to see if we get more low-latitude storms," Turtle said. "We've been continuing to watch Titan every week or so. We haven't seen any major cloud outbursts since then, and we're very anxious to see how quickly a progression into northern latitudes occurs. Most models predict clouds at the mid-latitudes in the northern hemisphere, so we're anxious to see if those, in fact, do pick up."